opening performance: Piece of György KURTÁG entitled 'Összefonódó testek' (Interwoven Bodies) is performed by Benedek DEVICH on double bass. Sári GERLÓCZY had two exhibitions in the Liget Gallery so far: in 1992 she showed her recent drawings, in 2009 her newest paintings. The title was: 'Harapás' (Bite). The 'Társas mező 7.' (Social Field 7.) is a selection of her freshest paintings and drawings made in the last few months although she returns the topic which was always in the center of her interest. The exhibition titled 'Társas mező 9' (Social Field 9.) was shown in the A.P.A. Gallery in 2014. If we look at the number, the current exhibition seems a step backwards, but it is for sure, these works are more recent. Or rather, will there be one or more older pieces, this is an unanswered question. The concept of „társas mező” (social field) was introduced to the Hungarian social psychology and science by Ferenc MÉREI in his book entitled „Közösségek rejtett hálózata” (Hidden network of communities) which was published in 1971. MÉREI gave not only the history and interpretation of micro sociology but gave also a method of research for examine the relations within groups. This is called sociometry*. The works of Sári GERLÓCZY (drawings, paintings, collages) are not abstract, and mostly represent humans. Rare exeption when she paints the root of ginger, which is used both for spice and medicine. She paints human figures, rarely one or two, more often three or more. Rarely faces, more often whole human bodies, who are moving to or from each other. They don`t wear clothes. They are not really naked, because the artist depicts ghost bodies rather than realistic, sensory bodies. It is a hard question to decide that these bodies painted or drawn by her are males or females, adults or children. When and where she thinks, it is important, she marks these attributes with references to secondary sexual characteristics (such as long wavy hair, feminine clothes in the case of women). So in the world of Sári GERLÓCZY always the humans are in the centre. She uses subtle, restrained references to the types of relationships on her pictures (love affaire, brothers, parents and their children, friends) and to the phases of relationships to keep us informed. 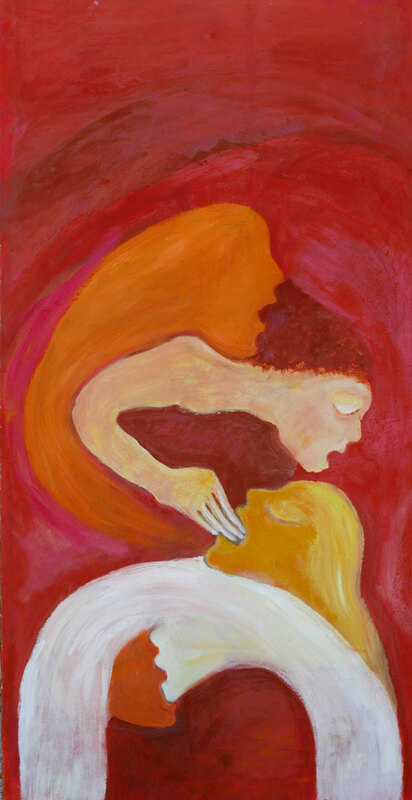 When last time Sári GERLÓCZY had an exhibition here entitled „Harapás” (Bite), that time she focused on faces and the possible meanings of bites within human relations. (imagiary bite, bite in a dream, real bite, like a kiss). The mouth (or bill), which is opening for a bite, without a partner can turn into a singing, shouting mouth. And of course it matters that the mouth`s of the faces turning towards each other, are opening or closing or opening simultaneously. What I haven`t mentioned are the hands. On the images of Sári GERLÓCZY the movements of the hands and legs are very importatnt. These movements are ethereal or similar to dance. The leaning of the body, neck, head describes relations, status of relationships. It is worth mentioning the eyes, which are sometimes important sometimes not, but often they become interesting to the artist, when they are shut. The moves of hands, palms and fingers need another study. date of download: 2016. July 08.